ASOR published further information about the damage to Tell Ain Dara in Afrin. Read more on the ASOR website here. 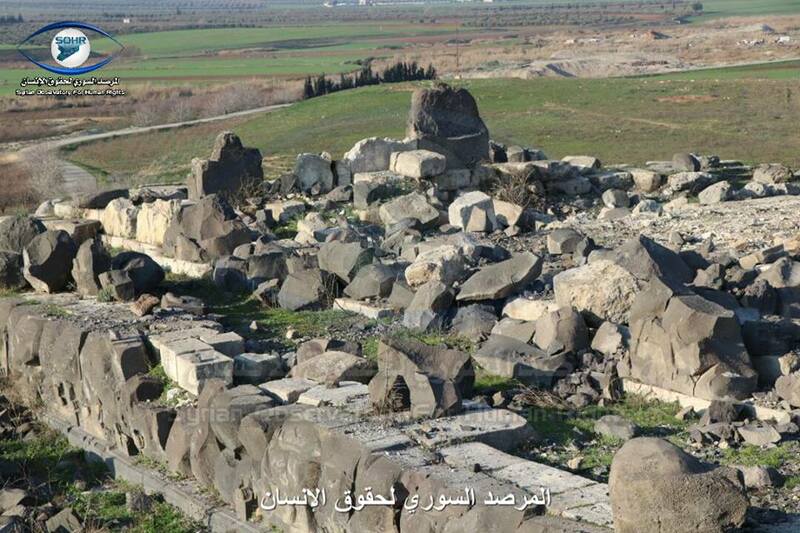 Photos by The Authority of Tourism and Protection of Antiquities shows the damage to Ain Dara Temple in Afrin. ATPA report additional damage to historic buildings in the area here. The ASOR’s Cultural Heritage Initiatives December 2017 Monthly Report is now available here. Illegal excavation is occurring at the Western Necropolis in Cyrene, Shahat, Cyrenaica, Libya. ASOR CHI Incident Report LHI 17-004. Two suspects have been arrested for smuggling relics and artifacts from Syria into Lebanon. Read more on the Al Bawaba website here. Four people were killed while digging for monuments in one of the homes of the town of Armor, which led to the collapse of the house over their heads, according to Step News Agency. A new video by New China TV show the restoration work in Aleppo, also it shows the latest discoveries in Bab Al Nasr. Xinhuan Net also wrote about how damage to buildings in Aleppo has inadvertently revealed their historic original structures and architecture for the first time in hundreds of years. Damascus University’s exhibition “For Aleppo” includes three hundred projects dealing with the ancient buildings and the historical sites of the Old City of Aleppo. The exhibition aims to develop a clear vision for the future of the Old City of Aleppo based on the scientific principles of conservation and the structural restoration of historical buildings. Read more on the Syria Times website here. A new video published by ASO shows 5 Mosaics which are dated to 62 BC; they were discovered at the northwestern of the industrial area of Manbaj. They depict fishing and some social customs in that period. The Syrian National Dialogue Congress in Sochi concluded with consensus on a series of principles concerning national identity and heritage preservation, among other topics. Read the full article on the Xinhua Net website here. This drone footage video shows the Chechnyya-funded restoration work at Umayyad Mosque in Aleppo. Aleppo Archaeology posted another video of the restoration work on their Facebook page, with Dr. Sakhr Alabi explaining the stages of restoration. The Digital Library of the Middle East publicly released its new prototype digital platform here. “In response to the tragic displacement of people and losses of life in conflict zones, and to ongoing threats to the cultural heritage of the Middle East through destruction, looting, and illegal trade, the Digital Library of the Middle East (DLME) proposes to federate Middle Eastern collections from around the world, creating a publicly accessible, seamlessly interoperable digital library of cultural material. The Syrian Heritage Archive project at the museum of Islamic Art has a new website available here. Syrians displayed crafts that bring together traditional skills, motifs and stories to create unique culturally blended products at Frankfurt’s Ambiente Trade Show. Read more on the Ahram website here. To celebrate the 100th anniversary of the Connecticut Institute for Refugees and Immigrants (CIRI) the Fairfield Museum & History Center’s new exhibit highlights the experiences of people who have built new lives in the area, including immigrants from Syria. Read about the exhibit on the Fairfield Sun website here. The National website explored how digital scanners and 3D reconstructions may help save Syria’s destroyed and damaged archaeological heritage. The Antiquities Coalition interviewed Professor Amr Al Azm about the The Day After Project, which recognizes the importance of protecting Syria’s cultural heritage sites and collections in order to enhance Syrian national identity and stabilization.